As summer approaches I like to experiment with different salads. I love pomegranate, as it goes well with savoury ingredients like sun-dried tomatoes and feta. I also am a huge fan of fluffy, light couscous, so why not have them all in one dish! Top tip: Proper coucous should be steamed three times, however, most supermarket varieties are great for quick preparation. 1. First place the couscous in a saucepan with a lid. Cover with freshly boiled stock, adding enough to cover the couscous by a few millimetres, place the lid on, and leave for five minutes. Once cooked through, there should be no liquid remaining, and the couscous will have swollen and become fluffy. Stir with a fork to break up the grains. 2. Using a fork remove the seeds from the pomegranate. 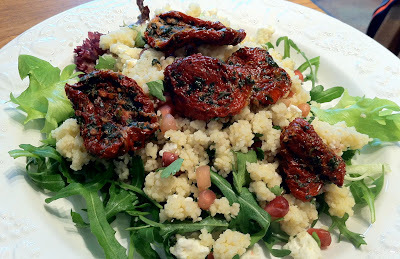 Stir the seeds and crumbled feta into the couscous, and place on a bed of rocket. Sprinkle sun-dried tomatoes and some of their oil over the top. Serve as a starter or as a healthy main course.